up until recently, i hadn’t eaten a peanut butter + jelly sandwich since I was a child. but, when i wasn’t able to do much cooking in the first few months of my pregnancy, due to stubborn morning sickness, my husband had to fend for himself dinner-wise many nights, + peanut butter + jelly sandwiches became his go-to meal. i took a bite one evening + holy moly, i had forgotten how delicious a good ol’ pb+j is! since then, i’ve eaten an alarming amount of pb+j sandwiches – they’re just so darn tasty! 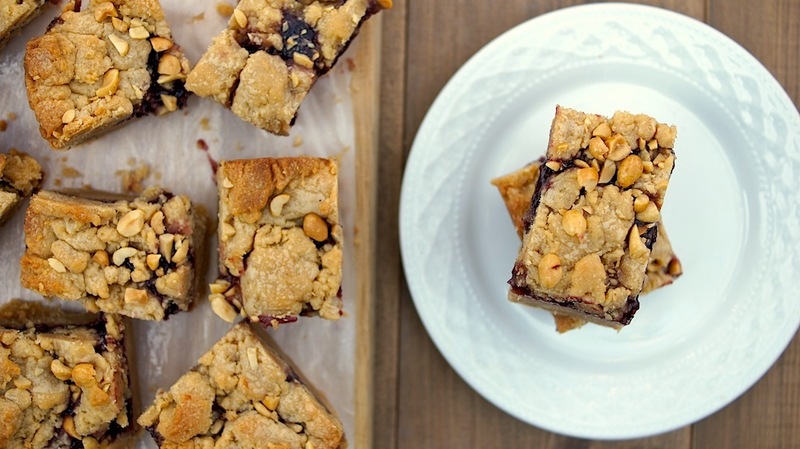 so when I stumbled across a recipe for pb+j bars, i knew i had to try them. so, how are they? just as scrumptious + addictive as i expected they’d be. the rich, peanut buttery layer pairs wonderfully with the sweet-tart jam layer, + they have the perfect combo of sweetness + saltiness. they make for a seriously delicious afternoon snack or dessert, especially when paired with a cold glass of milk. 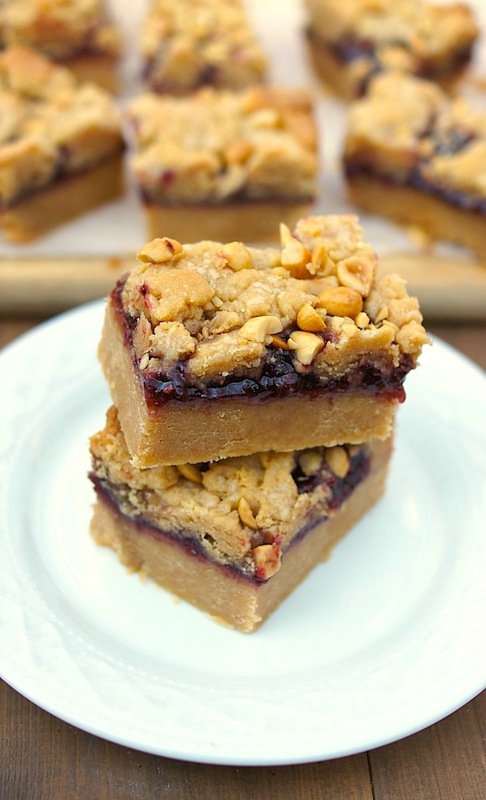 so, if you’re looking for a fabulous new way to enjoy peanut butter + jelly, absolutely give these amazing bars a try! grease a 9 by 13 by 2-inch pan. line it with parchment paper, then grease + flour the pan. in the bowl of an electric mixer fitted with the paddle attachment, cream the butter + sugar on medium speed until light yellow, about 2 minutes. with the mixer on low speed, add the vanilla, eggs, + peanut butter + mix until all ingredients are combined. in a small bowl, sift together the flour, baking powder, + salt. with the mixer on low speed, slowly add the flour mixture to the peanut butter mixture. mix just until combined. spread 2/3 of the dough into the prepared cake pan + spread over the bottom with a knife or offset spatula. spread the jam evenly over the dough. drop small globs of the remaining dough evenly over the jam. don’t worry if all the jam isn’t covered; it will spread in the oven. sprinkle with chopped peanuts + bake for 45 minutes, until golden brown. cool + cut into squares. I’ve made these before and these are pure heaven. Best part about these has to be the extra peanuts on top. Love it Amy! Wow! These look amazing. I actually had to get up off my couch and walk in the kitchen to make myself some PB&J toast to satisfy the craving these bars just created!